Typical phosphor converted LED lighting starts with a blue LED light source. Phosphor is added to the LED package to convert the blue light into a mixture of light that appears white. The phosphors help create green, yellow and red light components that makeup the white light. Producing red light with phosphor produces lower efficacy and red phosphors are very expensive raising the monetary cost to produce red light. Because of this, most LED light sources are lacking in red light. Those sources that have red components are often more expensive and lose significant efficacy. The lack of red in light sources is often not a problem in most general lighting requirements. 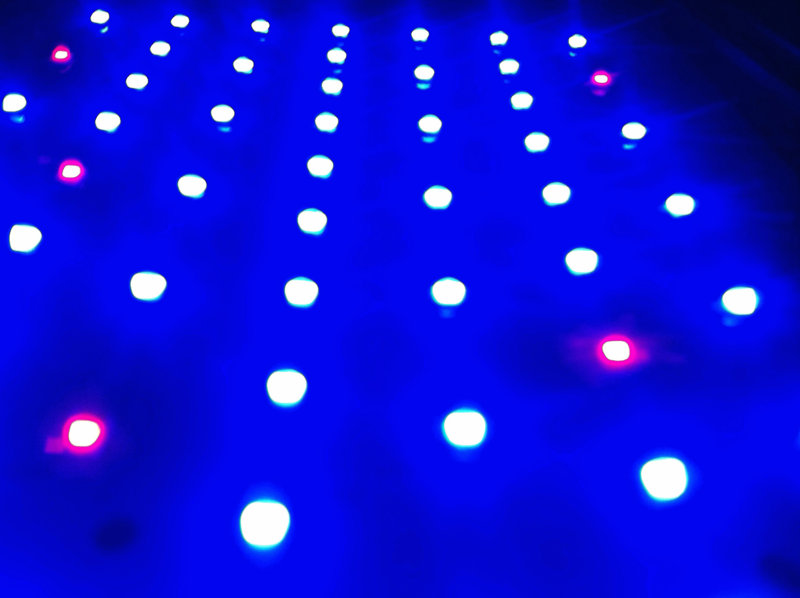 Some applications benefit greatly from lighting systems that have higher red content. This paper will discuss those requirements in inspection processes. Horner Light uses a unique process for combining the phosphor with the LED. Instead of placing the phosphor directly on the LED, Horner uses a remote phosphor technology that places the phosphor away from the LED. This has numerous advantages including longer life, higher efficacy, better color consistency and even light distribution. In 2012, Horner determined that red light passes through the phosphor material with very little change in wavelength or output. This enabled blending blue and red LEDs behind the phosphor to increase the red content of the light source. This not only increases the color rendering index (CRI) of the light, but it also creates a three peak light source that slightly over saturates colors making them appear more pleasing. This does add some cost to the light, but often not as much as other technologies. This technology also has a higher efficacy than phosphor-based red enhancement solutions. By mixing the color through phosphor you create an even mixed light output. Discrete color LED solutions can produce color fringing and multi colored shadows. CRI is often used to judge the ability of a light to produce accurate colors. The CRI can help evaluate light sources but there are often other details that need to be considered. The Department of Energy has a good article1 that explains CRI and how it is used to select a light source. CRI testing basically bounces the light source off 14 different colors. The light reflected is compared to its accuracy against a black body light (basically an incandescent bulb). 100 is the best possible match in color, the lower the number the less accurate the colors. You will notice the sample colors are mostly lighter and pastel colors. LED lighting often does poorly with the R9 color accuracy. For general lighting a R9 value of greater than zero is often considered acceptable. Horner’s red enhanced remote phosphor lighting can often improve this R9 value to 50 to 70. The CRI is only one aspect of light quality. 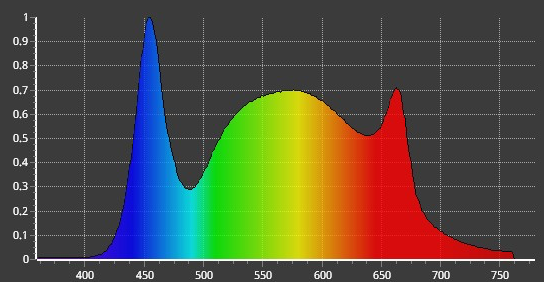 You will notice that the spectrum from red enhanced lighting produces 3 peaks. These peaks slightly over saturate blue, green and red colors. In a study conduced by the Museum of Natural History in Paris, France2 they compared halogen lighting, RGB variations, white LEDs and white LEDs with color enhancement. Even though halogen light produces a higher CRI, the color enhanced white led light source provided the best subjective and measured color accuracy over a wider range of color tests. This color enhanced white led light very closely matches the red enhanced remote phosphor light output. In another study by the Lighting Research Center, Rensselaer Polytechnic Institute3 they compared white LEDs, RGB LEDs and halogen lighting sources. They found that the RGB light source was preferred even with a much lower CRI. Both these studies show that having red, green/yellow and blue lighting components of a light source are important for perceived and objective light quality. We have shown how red enhanced lighting is different and better; but is it necessary for inspection tasks? For general lighting red enhancement will likely be more favorable but is not necessary. Studies have also shows that for reading and writing or other black and white visual tests, higher CRI are not required for better performance. Inspection of most raw metals will not benefit from red enhanced lighting. SAE document 2011-28-00734 explains how green or green/yellow lighting is best for this task. Horner has a line of color tuning light that can provide this lighting source. Tasks that require color matching and color inspection can benefit from red enhanced lighting. Task where objects are red, purple or brown colors will be improved with red enhanced lighting, 3D vision around these colors also improves as more shades of the object can be visually observed. Inspections involving colorful painted surfaces, wire colors, chemical indicators or furniture finishes can benefit from red enhanced, higher cri, remote phosphor lighting. The FAA has researched lighting for visual inspections. Their document titled, Design of the Aircraft Inspection/Maintenance Visual Environment5 recommend high CRI task lighting for use during inspection. This lets them see changes in metal color for corrosion or heat damage. One of the key studies for automotive paint/metal inspection is documented in the SAE document 37-19976 performed at Lighting Research Center, Rensselaer Polytechnic Institute. This study helped set the standards for light source spacing in contrast lighting systems. This study didn’t use florescent light but actually used a projector that projected patterns of light and dark stripes that could be easy varied for testing. Projectors use high intensity bulbs with CRI near 100. This allows the color accuracy of projected images to be as high as possible. The testing did not vary the light source other than intensity. Paints with red, purple and brown colors reflect red wavelengths of light. If the light source does not contain sufficient red the apparent contrast will be lower and may not be sufficient for defect detection. The above information was designed to provide lighting specifiers with information that will help choose the right technology for different inspection or tasking lighting situations. Remote phosphor lighting by itself provides excellent benefits including longer life, higher efficacy, better color consistency and a more even output. When remote phosphor technology is combined with Horner’s unique red enhancement technology it produces a high CRI light that is objectively and subjectively better light quality. Inspection processes that require color recognition or inspection of red, purple or brown subjects will further benefit from the red enhanced light output. US Department of Energy. 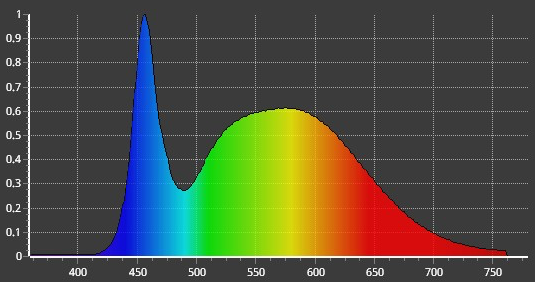 “Color Rendering Index and LEDs.” LED Measurement Series: Color Rendering Index and LEDs 56891st ser. PNLL.SA (2008): 1-2. Vienot, Francois, Elodie Mahler, Jean-Jacques Ezrati, and Clotilde Boust. “Color Appearance under LED Illumination: The Visual Judgement of Observers.” (2008): 1-6. Shakir, Insiya, and Nadarajah Narendran. “White LEDs in Landscape Lighting Application.” Society of Photo-Optical Instrumentation Engineers (2002): n. 1-10. Gopinath, P.K, J. Devadawson, R. Radhakrishnan, and M. Nandakumar. “A Study on Spectrum of Lights – Quality Retrospective.” Society of Automotive Engineers 2011th ser. 0073.28 (2011): 1-7. Reynolds, J. L., Gramopadhye, A. K., & Drury, C. G. (1992). Design of the aircraft inspection/ maintenance visual environment. In Meeting Proceedings Seventh Federal Aviation Administration Meeting on Human Factors Issues in Aircraft Maintenance and Inspection: Science, technology, and management: A program review (pp. 151-162). Washington, DC: Federal Aviation Administration/ Office of Aviation Medicine. Boyce, Peter, Nicola Ferzacca, Ynjian He, and Charle Loyd. “Paint Inspection Lighting: Optimization of Lamp Width Spacing.” Society of Automotive Engineers 1997th ser. 37.1 (1997): 1-37.